In yesterday's post we shared with you a resourceful document explaining the concept of Bloom's Digital Taxonomy and how teachers can incorporate it in their instructional strategies. Today, we are adding another equally important resource from Andrew Churches. These are some handy sheets covering each of the thinking levels of Bloom's taxonomy (remembering, understanding, applying, analyzing, evaluating, and creating). For each level Andrew provided a set of activities involving the use of different web tools that students can use to develop the thinking skills related to it. For those of you new to Bloom's digital taxonomy, make sure you familiarize yourself with the concept before you use the worksheets otherwise they wont make much sense to you. Bloom's digital taxonomy, as we have argued elsewhere, is the digital version of the Revised Bloom's taxonomy.While it is primarily digitally focused , Bloom's digital taxonomy, as Andrew stated, is not about web tools or technology, it is rather about effective use of technology to facilitate learning. For instance, Andrew added, "bookmarking a resource is of no value if the resource is inappropriate, invalid, out of date or inaccurate." 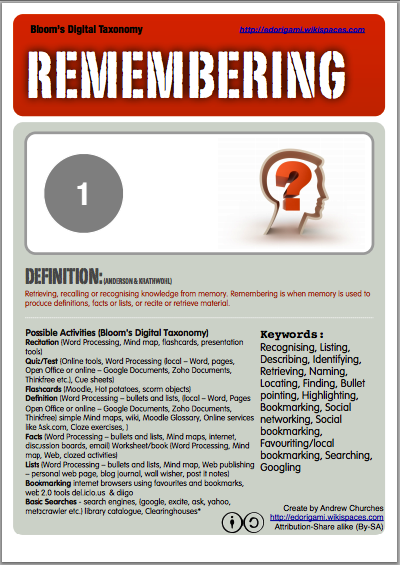 Bloom's Digital taxonomy sheets are available for free download from this page.